The post Inside the Adventures of Rossie Possie by Annie Butler Shirreffs appeared first on Dogster. Copying over entire articles infringes on copyright laws. You may not be aware of it, but all of these articles were assigned, contracted and paid for, so they aren’t considered public domain. However, we appreciate that you like the article and would love it if you continued sharing just the first paragraph of an article, then linking out to the rest of the piece on Dogster.com. Everybody like a good party, and dogs are no exception. 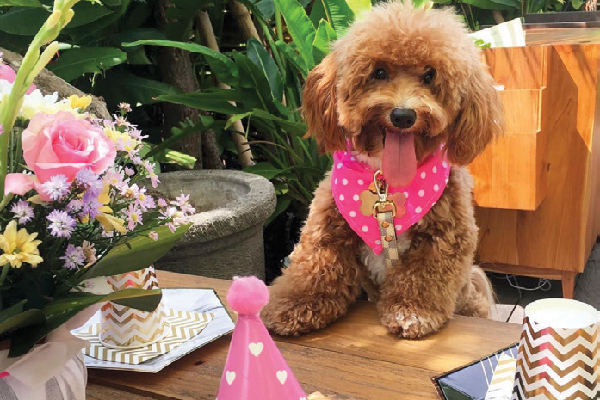 When we first came across these photos of Rossie Possie’s first birthday party on Instagram, we just had to learn more about her. How did Rossie Possie get started on Instagram? Rossie lives in Bali with her human mom Wulanda Wully, who received Rossie as an anniversary gift from her husband. The sweet and adorable Malti-Poo has lots of fans. One day, when Rossie was a puppy, Wulanda took her to a local beach club, where Rossie was a hit. “People just came up to her, wanting to touch and hold her, and take pictures,” Wulanda says. That instant popularity gave Wulanda the idea of starting Rossie’s Instagram page. Rossie has a group of special doggie friends she hangs out with all the time. As Rossie’s first birthday approached, Wulanda decided to throw her a party. It took place at a café that allows pets and has a big, grassy area where they can run around. The party was a huge hit! When I asked Wulanda how she was able to take such great shots of the party, she told me that every pet parent has different ways to make their dogs cooperate. “I just asked Rossie to stay and listen.” Luckily, Rossie has been posing for photos since she was a puppy. Now she’s a natural! Check out Rossie’s adventures on Instagram @rossiepossie_in_bali.